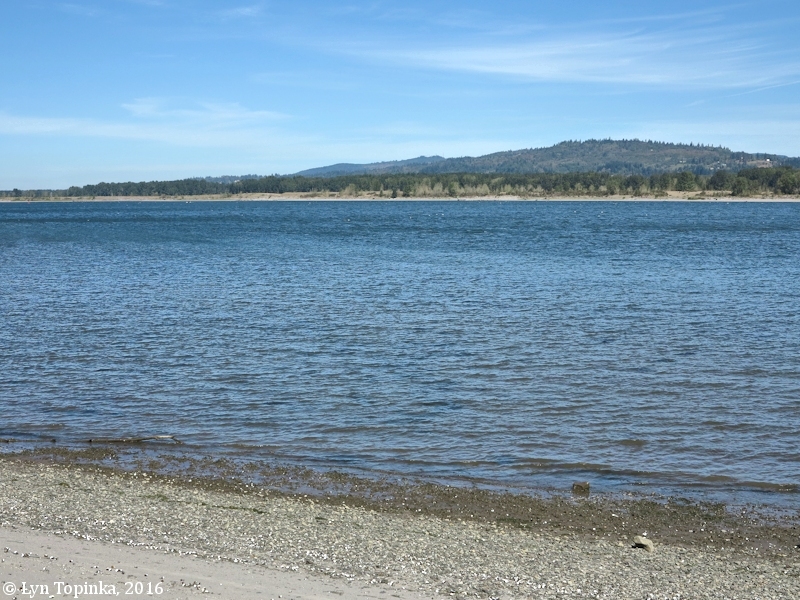 Click image to enlarge Mouth of the Cowlitz River, Washington, with Cottonwood Island on the right. 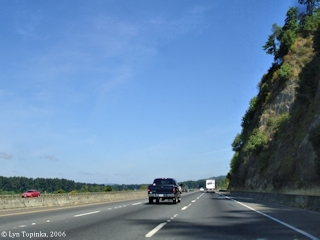 Image taken August 2, 2003. Cottonwood Island is located near the Washington side of the Columbia River and stretches between Columbia River Miles (RM) 68 and 71.5. The island helps define the mouth of the Cowlitz River. Cottonwood Island is separated from the Washington shore by Carrolls Channel and Carrolls Bluff rises alongside. 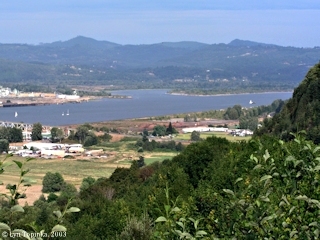 Downstream are the Washington communities of Longview and Kelso and upstream is the community of Kalama. 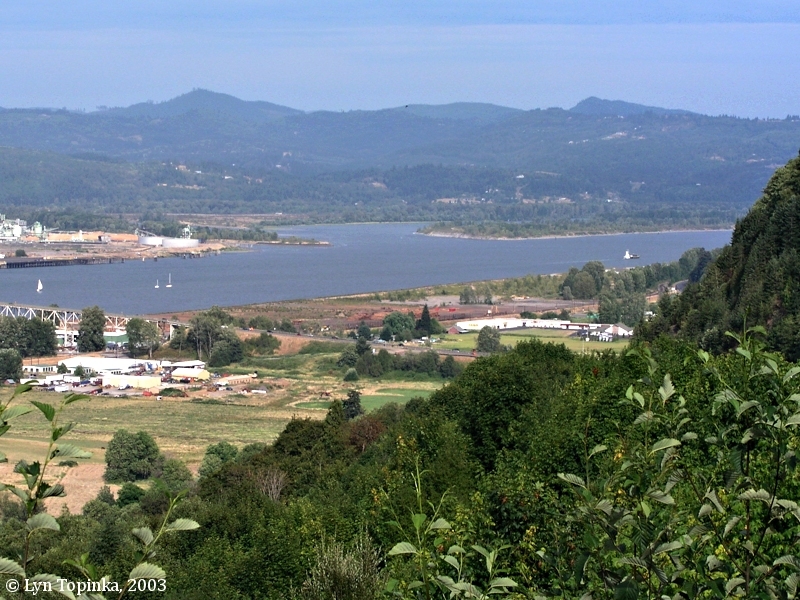 Across from Cottonwood Island, on the Oregon side of the Columbia River, is the Oregon community of Rainier and the small community of Prescott. Lewis and Clark passed Cottonwood Island on November 6, 1805, on their way to the Pacific Ocean. On their return, Lewis and Clark pass by Cottonwood Island on March 27, 1806. Lieutenant William Broughton of the Captain George Vancouver Expedition passed by Cottonwood Island on October 27, 1792. "Knights River" is today's Cowlitz River. Lewis and Clark passed Cottonwood Island on November 6, 1805, on their way to the Pacific Ocean, and then again on March 27, 1806, on their return. In 1841, Wilkes, of the U.S. Exploring Expedition called the island by the Indian name, Kanem, meaning "canoe". Cottonwood Island was changed to the present name by the U.S. Coast & Geodetic Survey for the abundant growth of cottonwood trees on the island. The 1888 navigation chart, "Columbia River Sheet No.4, Grim's Island to Kalama" shows "Cottonwood I.". Click image to enlarge Cottonwood Island (left) and Carrolls Bluff (right). View heading north on Interstate 5. Image taken August 12, 2006. 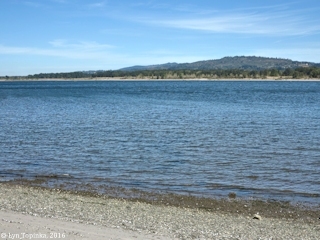 Click image to enlarge Cottonwood Island, Washington, as seen from Prescott Beach, Oregon. Image taken September 9, 2016.